I’ve written before that I have a problem with chocolate. Fortunately, it’s not just solid chocolate that satisfies my cocoa cravings. For example, I’ve recently been drinking chocolate-tasting porter and stout beers. And now winter’s on the way, I’ve started upping intake of hot chocolate too. However, as my experience with the KitKats today proves, that might not be enough. It’s lucky then that I’ve also just discovered a variety of chocolate-tasting cocktails, courtesy of “Chococo-Late” – an event hosted by Cabinet Rooms and held at Winchester chocolate house, Chococo. Chococo-Late is just one of many events Gary and Marcus from Cabinet Rooms have run in the city. 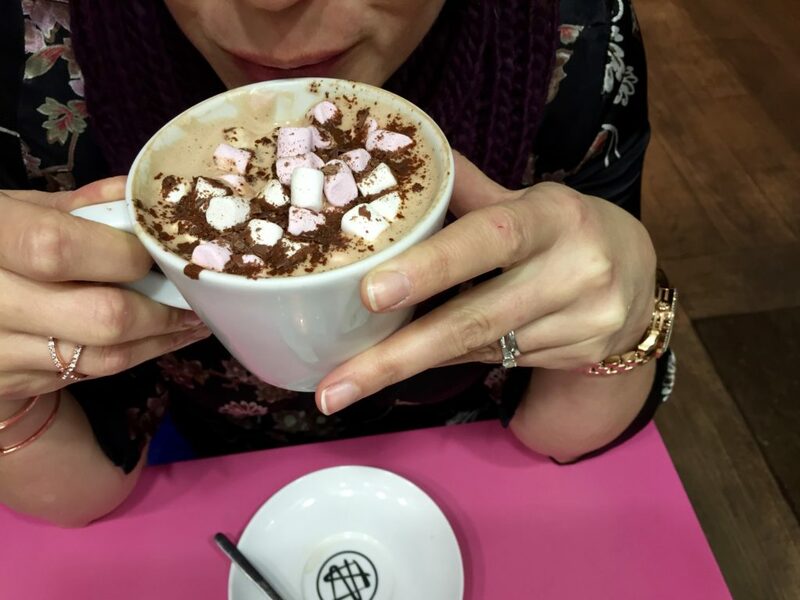 These include an evening of food, drink and ghostly tales on their “Spirits of Winchester” Halloween tours (which incidentally begin with a rum-laced hot chocolate at Chococo) and their regular “Kitchen Cabinet” events at the city’s Forte Kitchen restaurant/cafe. They’re also the mixers and shakers behind Winchester Cocktail Week. Like me, Chococo was born in Dorset. It makes its chocolates near Wareham, using local produce where possible. As well as here in Winchester, it has shops in Swanage and Exeter. We arrived at Chococo just after the start time of 8pm and took a seat by the front window. The shop is in a narrow unit at the bottom end of the High Street. It’s cosy, made even more so tonight by candles on all the tables. 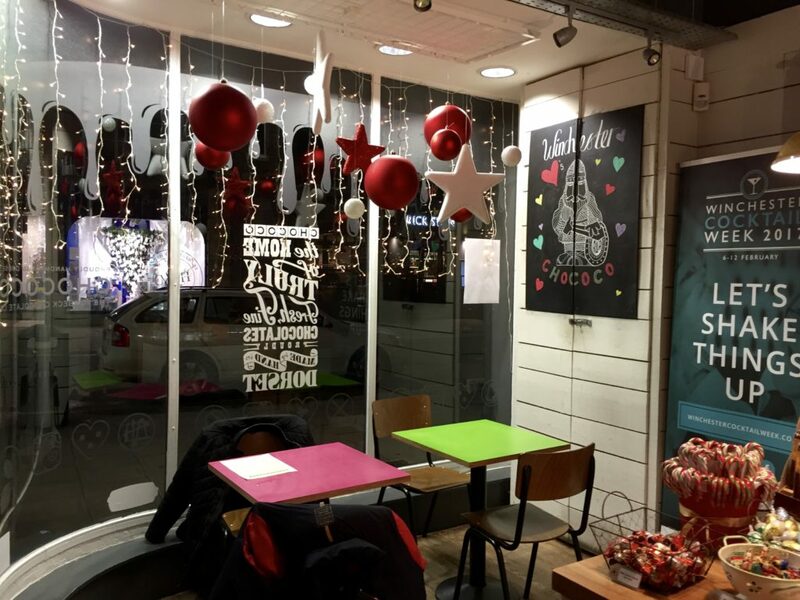 With tonight being the Christmas lights switch on in the city, Chococo-Late was an all-ticket affair. That said, the streets were surprisingly quiet – it seemed like most people disappeared after the lights started their twinkle, keen to save their excitement for December. 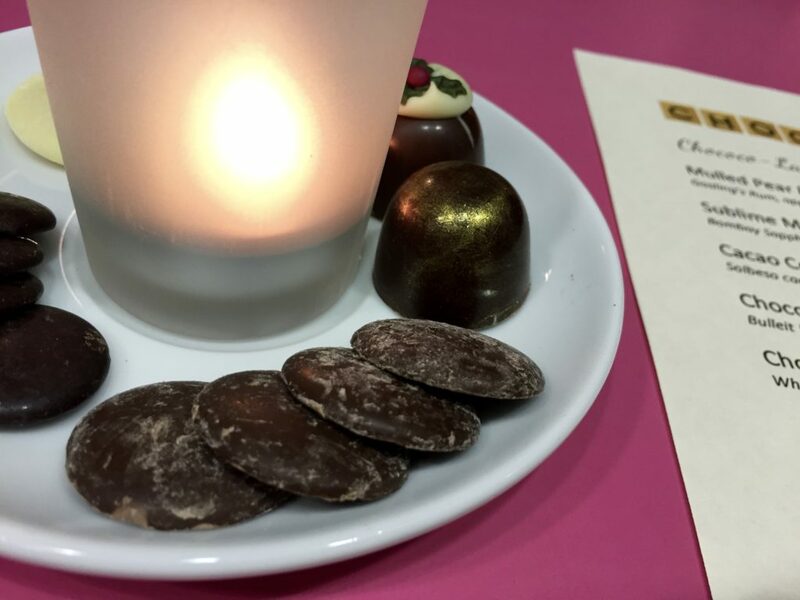 We munched on the complimentary chocolates as we perused the menu of cocktails and sweet treats. As well as being a fan of chocolate, I also have a minor addiction to figs. 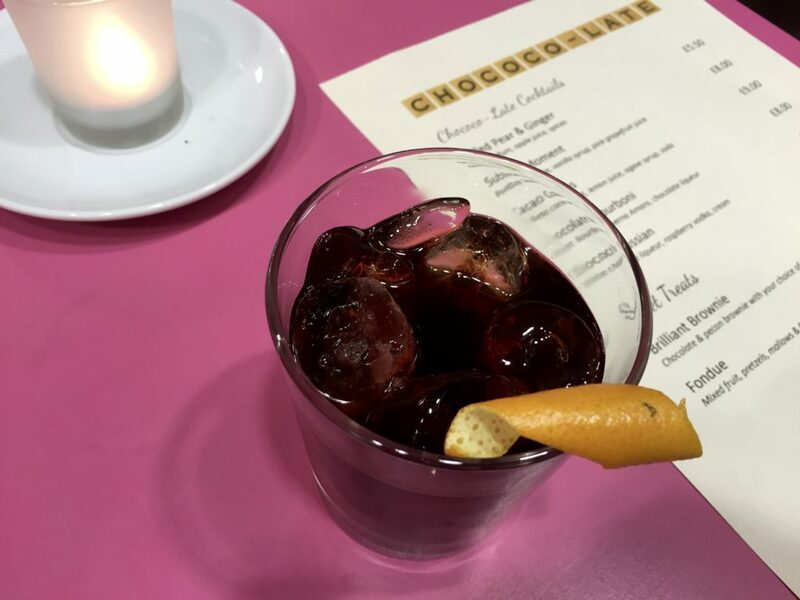 So I particularly enjoyed Chococo’s latest creation, the dairy-free “Tawny Fig Chocolate”, which consists of Madagascan chocolate blended with Tawny Port-soaked figs. The “Fizzy Pudding Chocolate” was also lovely, and almost got this Grinch into something resembling a Christmas mood with its combination of spiced hazelnut praline and popping candy. However, it was the cocktails that were taking centre-stage tonight. And while Tiff ordered a house hot chocolate (she was driving), Marcus ran me through the cocktail list. For a chocolate-themed event, I was expecting tonight’s cocktails to be rich and cream-based. But, only one cocktail (the “Chococo Russian”) contained cream. 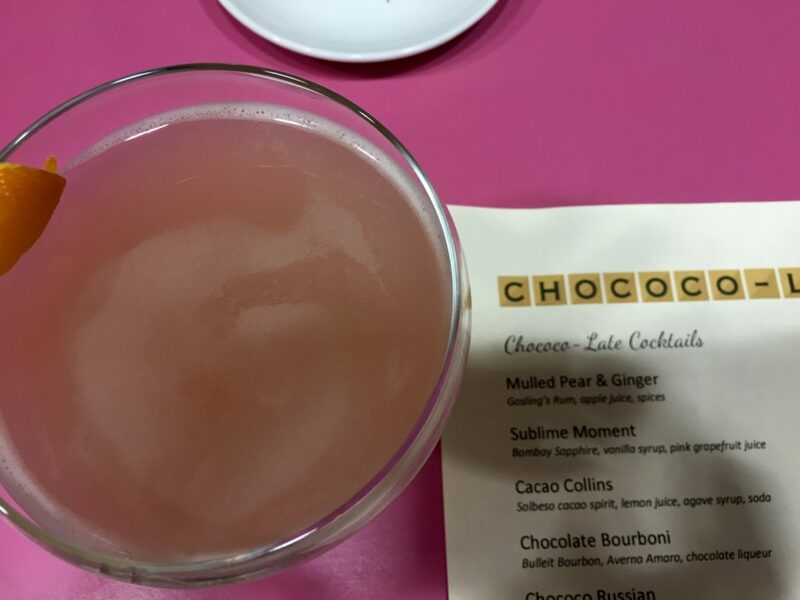 And it was a cocktail that included nothing remotely chocolatey in its ingredients – the “Sublime Moment” – that took my fancy first. The genius of this cocktail, created by Bombay Sapphire’s Sam Carter, is that its mix of gin, vanilla syrup and pink grapefruit juice produces a taste similar to dark chocolate, despite its refreshing and light mouthfeel. Next up, I had the “Chocolate Bourboni”. This was a Cabinet Rooms recipe, mixing Bulleit Bourbon, Averna Amaro and chocolate liqueur over ice to create a warming yet refreshing drink. Meanwhile, I munched on the rest of our chocolates as I sipped my cocktail – a dream combination. Finally, I prepared for the chilly walk back to the car with a mulled pear and ginger cocktail as I caught up with Tim from Culinary Chatter. 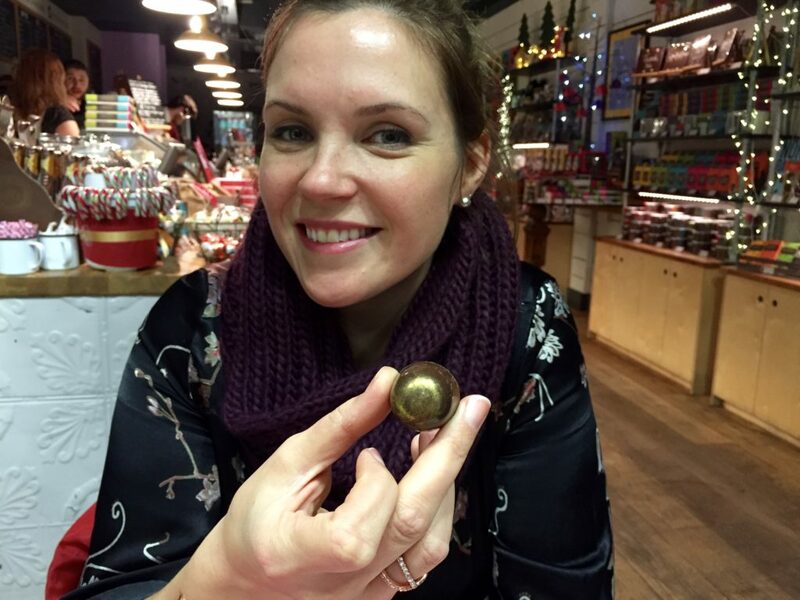 Someone had left without eating all of their chocolates – I didn’t need a second invitation to get stuck in. I’ve never really been a fan of cocktails, apart from the odd “Snakey B” or Reef and vodka (a killer combo and banned by some pubs!) in my student days. Tonight, however, could be a turning point for me. 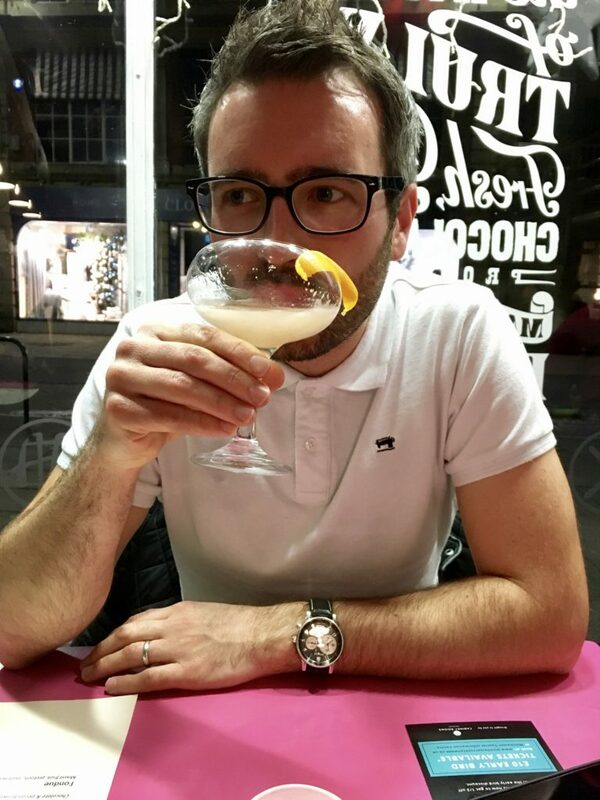 I might even have to experiment with my own chocolate-flavoured cocktails – any idea how I can create a KitKat Chunky cocktail? Info: Cabinet Rooms organises various food and drink events in and around Winchester. See their website for details of upcoming events. 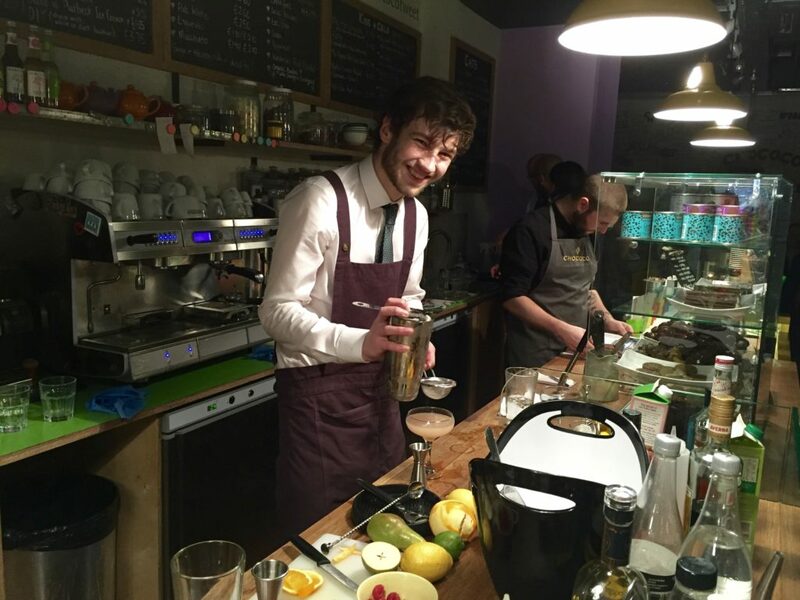 Winchester Cocktail Week 2017 is 6-12 February. Chococo Winchester is at 152 High Street, Winchester, SO32 9AY. Disclaimer: I didn’t have to pay for our two tickets for this event.